It's easy to get distracted by misleading claims on your fave foods. Thankfully new nutrition labeling programs are making shopping trips easier. You can't walk into a grocery store without seeing bolded claims adorning every box, package, and wrapper in the store. Low fat! High fiber! Smart choices! Though Nutrition Facts labels don't lie, it's easy to get distracted by these misleading claims. A big green can’t-miss-it check marks the packages of healthier foods. Though a lot of experts weighed in on the program, several major food companies helped fund the program and companies pay to be involved. Low-calorie foods that are void of nutritional value (like Froot Loops) are receiving check marks, and consumers aren't fooled. The Smart Choices website defends the Froot Loops inclusion by claiming "pre-sweetened cereals have been demonstrated to be a good source of vitamins and minerals for children," but the program has drawn criticism from Forbes, The New York Times, and Nightline. Calories and servings per package are the only numbers beneath the check. But as most of you dieters know, calories alone aren't everything. A serving of Mueslix has 90 more calories than a serving of Froot Loops, but a lot of people would argue that that doesn't necessarily mean the Froot Loops are healthier. Because companies pay to get into the Smart Choices program, it doesn’t evaluate every single product in the store. For example, a serving of Bob's Red Mill Old Country Style Muesli gives you an equal amount of fiber as check-marked Kellogg's Mueslix, with no added sugar or high-fructose corn syrup, but isn't in the Smart Choices program. Kellogg's Mueslix has more fiber, protein, and B-vitamins than Froot Loops, but they have the same green check on the box. A product could barely meet the criteria or be a superfood and you'd never know the difference. Colorful front-of-packaging labels are designed to give you the scoop on key nutrients with a quick glance. Because the information is on the package, it goes home with you. Developed in the U.K., it seems on its way to becoming a standard in Europe (here's the British "What's Inside Guide" explaining GDAs), and GDA is already being used in the U.S. by Mars and also on some Kellogg's cereals along with the green Smart Choices check. Because it began in the U.K., it's not consistent to U.S. measurements and standards. Busy parents should note that the Guideline Daily Amounts are based on an adult diet—not a child’s. This label doesn’t tell you anything different than the Nutrition Facts panel; it actually tells you less. For me, it doesn’t seem to be that much extra effort to pick up the box and turn it to the side. Foods get either one, two, or three stars, depending on how healthy they are. It also takes into account things you want more of and things you want to avoid. Water, coffee, tea, spices, or alcohol aren't ranked, and if a food doesn’t meet nutritional standards, it doesn't get a star. Guiding Stars is a grocery-store initiative, so it isn’t based on whether food manufacturers pay to get in, and it’s not dependent upon food companies changing their packaging. Looking for a specific ingredient? You have to read the label to get the details on nutrition and ingredients. Because the rating is on the grocery shelving and not the packaging, the stars don’t follow you home. Guiding Stars is exclusive to Hannaford Supermarkets, which isn’t nationwide. Foods are ranked on a scale of 1 to 100, with higher numbers indicating healthier choices. The scoring system is an algorithm developed by Dr. David Katz that takes into account both the good and bad things in your food. Food manufacturers don’t pay to get into the program, nor do they have to change their packaging. 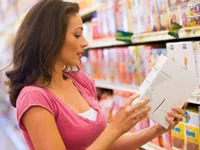 Products that you might think are healthy because of the brand, packaging claims, or the food itself may not rank so high once the nutritional numbers are crunched through the NuVal system. Because the ratings are shown on store shelving, they don’t follow you home. Not every food is rated (yet), and this program isn’t used in every store nationwide. If you make a personal choice to, say, avoid products with artificial sweeteners, the NuVal score alone may not be as valuable to you. Breyers Black Cherry Jubilee Light Yogurt ranks a 99, but it also contains aspartame. Stonyfield Farms Organic Fat Free Black Cherry Yogurt doesn't have any artificial sweeteners, but it gets a 64. Across the board, no matter the ratings system or the food, you’ll still have to dig past the labels to find what’s important to you. Maybe you don’t mind artificial sweeteners, but what if you’re allergic to dairy, or you can’t eat wheat products? What if organic and hormone-free foods are important to you? As a consumer, you still have to look at the Nutrition Facts label and the ingredients list. If you’re dieting, chances are your diet program or plan has some grocery shopping tips. For example, Weight Watchers teaches members how to evaluate nutrition labels for key ingredients and encourages you to look for the most nutrition bang for your buck. At the most, you can hire a dietitian to take you on a grocery store tour. If you're still confused, here are two blogs I like to read for perspective on nutrition news: Food Politics, by Marion Nestle, author of Food Politics and What to Eat, and U.S. Food Policy by Parke Wilde, a professor (with whom I had the pleasure of studying) at Tufts University.